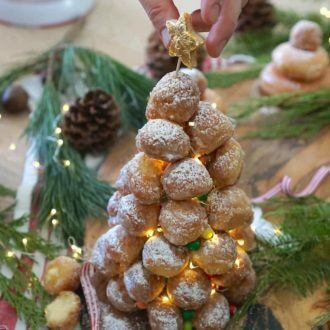 This take on the classic and Croquembouche is made from filled donut holes filled with homemade rum-spiked vanilla pudding, is an ultra-fast, easy, breezy version of the classic that tastes amazing! 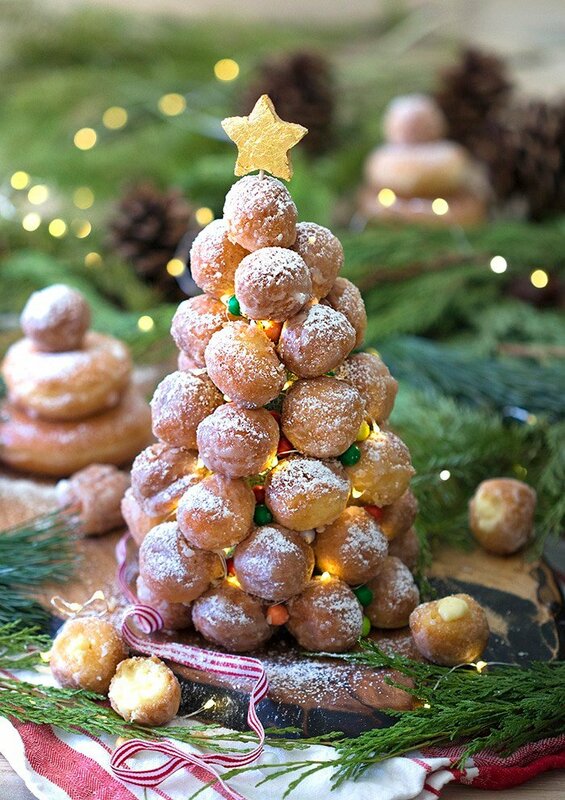 One of my favorite holiday treats is a proper Croquembouche, a tower of cream puffs drizzled crisp strands of sugar. But since I’m so busy with the twins running around I thought it would be fun to do a quick hack of this recipe where you get the same visual with a MUCH quicker process. While you could make your vanilla pudding from a packet I will always recommend making it from scratch. It’s just too easy and tastes so much better every time. I added a couple teaspoons of spiced rum to flavor mine but you can substitute for a bit more vanilla if you’d like. 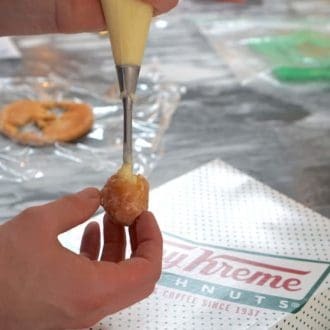 Doughnut holes are not hollow like choux so you’ll need to make some room in the middle either with your piping tip or a little knife. It’s really easy and SO GOOD when you bite into a cream-filled sugar puff. 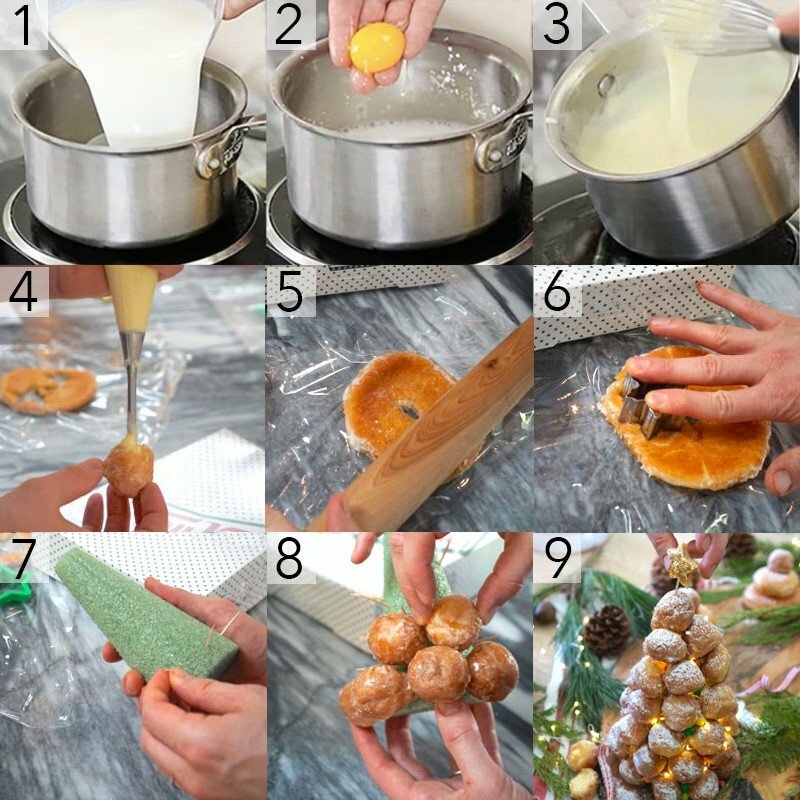 If you want to make the more traditional for of this recipe try making the choux puffs! They’re deceptively easy and DELICIOUS! For the Full holiday effect I added mini LED lights to the cone before the donut holes went on. Love the effect. Click here to buy a set! 1 To make the vanilla pudding whisk sugar, cornstarch, and salt in a saucepan. Add milk into the sugar mixture. Stir until a paste. 2. Add egg yolks and whisk together on low heat. 3. Cook the mixture on a low heat, while stirring continuously. Let the mixture thicken but not boil over. Turn off the heat. Add butter, rum and vanilla. 5. 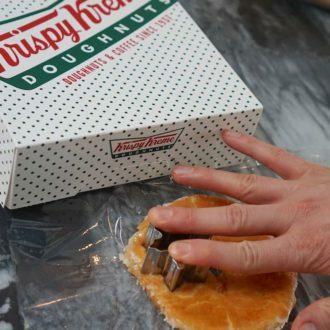 To make the star roll out a glazed doughnut between two pieces of plastic wrap. 6. 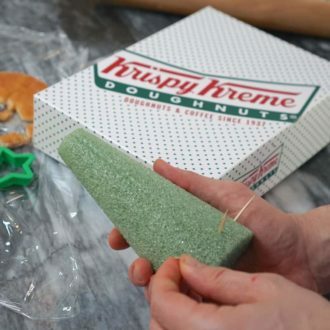 Cut out a star shape from flattened doughnut. Add gold leaf to the star. You can brush with a little water if it’s not sticky enough for the gold leaf. 7. Pierce the foam cone with toothpicks. String lights between toothpicks. These will hold the donuts on! At this stage I also added a string of mini LED lights onto the cone for added holiday cheer. 9. Dust with confectioners sugar. and using a toothpick, attach the star to the top. If you want to whip up a batch of traditional pastry cream and or choux puffs then click over for my cream puff recipe! Just pipe dots instead of bars unless you want an eclair tree, LOL. 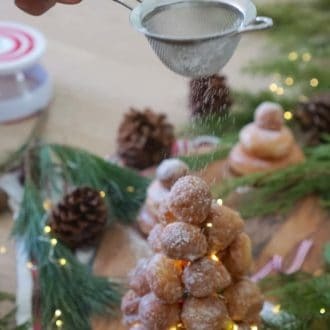 If you’ve tried this doughnut croquembouche then don’t forget to rate the recipe and let me know how you got on in the comments below, I love hearing from you! 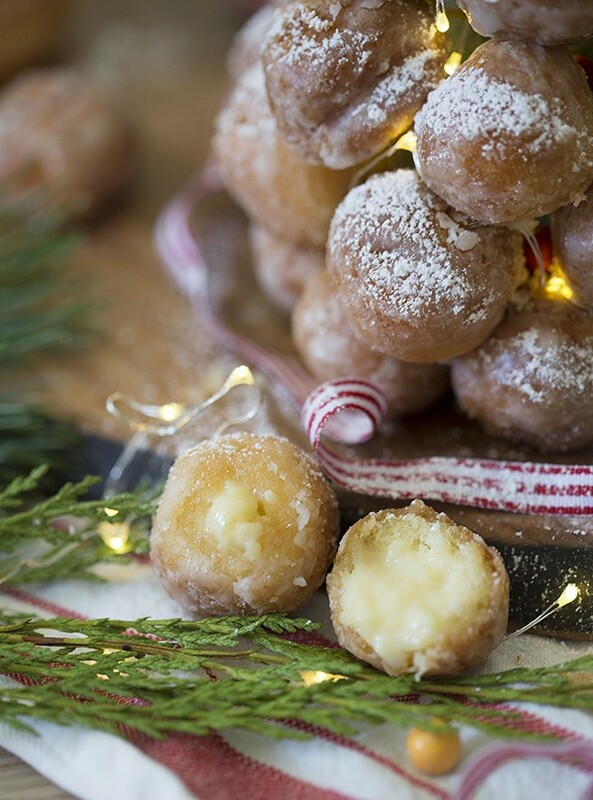 A holiday hacked Croquembouche made with Krispy Kreme doughnut holes and vanilla pudding. Transfer mixture to a piping bag fitted with a 230 piping tip. 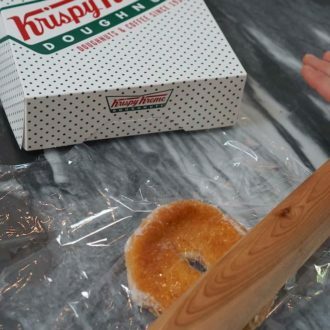 Roll out Glazed Doughnut between plastic wrap. 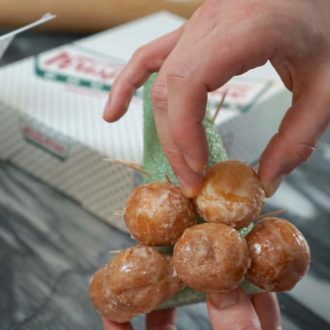 Cut out a star shape from flattened doughnut. Add gold leaf to the star. Pierce the foam cone with toothpicks. Using a toothpick, attach the star. This is adorable and I will probably make it, thank you. I do feel like you need to adjust your prep time and total time estimates though. Maybe for a pro they would work, but at a minimum you are not allowing for any cooling time from removing the pudding from the heat to putting it in the bag. I always feel like timing is underestimated by the pros. 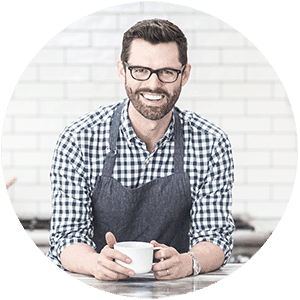 I also love the fact that in your byline you say that you are a Mom taught cook! Love your account! Thanks so much! I adjusted the time like you said! 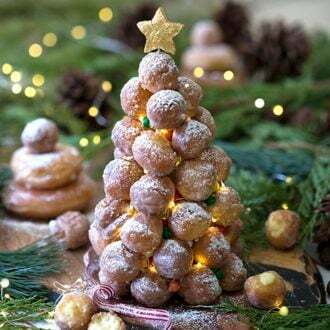 Hope you enjoy the croquembouche!